Excuse me while I jump for joy that this work week is over and that it was a quiet, short day at work. Perfect way to end such a busy week and I’m feeling much better than yesterday. It was also a productive day of finalizing gift purchases, wrapping and a trip to Whole Foods that didn’t break the bank. However, lunch was a little disappointing. Hubby and I went to Woody’s Grill & Bar where the vegan selection was weak, as in nothing on the menu was vegan, not even any of the appetizer selections. I finally selected an Asian Chicken Salad minus the chicken. Meh, it was okay. Not exactly filling. It irks me when the vegan selection is so weak at places that it requires serious modding of dishes and the overall flavor of it. Come on – this is California, not Kentucky! :-P You’d think a place would offer at least one strong vegan dish, especially if they’re targeting families and other large, diverse groups. Oh well, I’m done ranting. Since I got out of work early, I hit the insane traffic to knock off a few last errands starting with a visit to the GameStop to trade in my old Nintendo DS games for ones that are friendlier for my 5-year-old niece. I’m giving her my DS for Christmas since I hardly use it anymore and she’ll love it. Next was Whole Foods where the first order of business was a little refreshment. 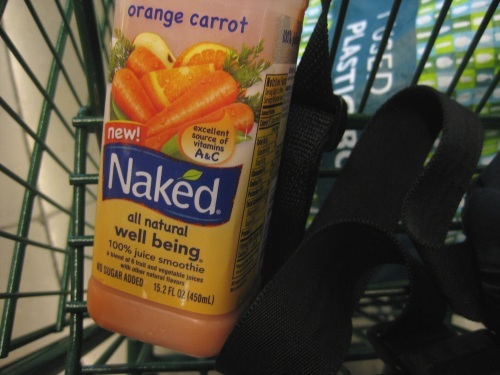 Very good, stronger on the carrot juice flavor and not too sweet. Then an impulse buy or two. 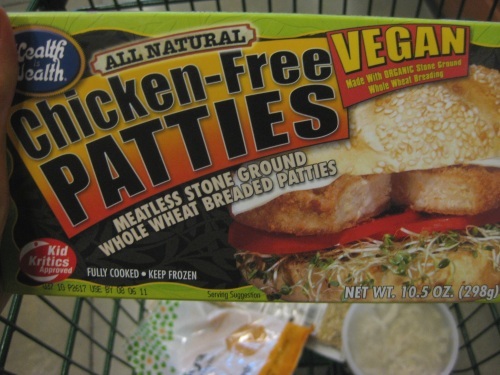 Never tried these, but I figured hubby and I could share them one night for dinner. 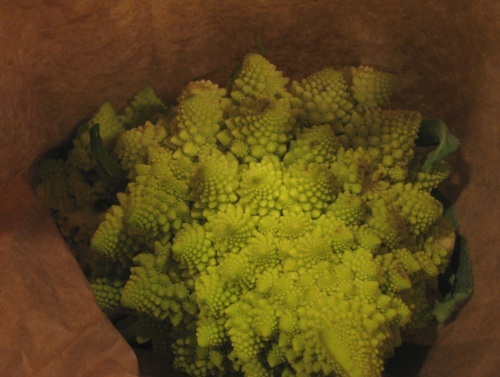 Also some more romanesco broccoli for a holiday dish. 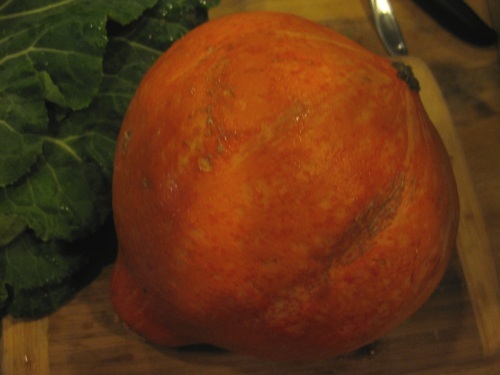 And a new winter squash to try, this should be fun. When I got home, stuffing all my loot into the fridge wasn’t easy! And my produce stash on the kitchen island is now taking over the island! It’ll be down to about half this after the holidays. 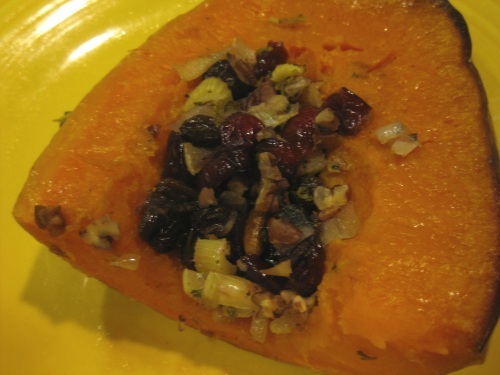 :-) After such a long day week, it was nice to reheat the leftover stuffed squash from yesterday for a quick dinner before hitting the gym, then the couch! 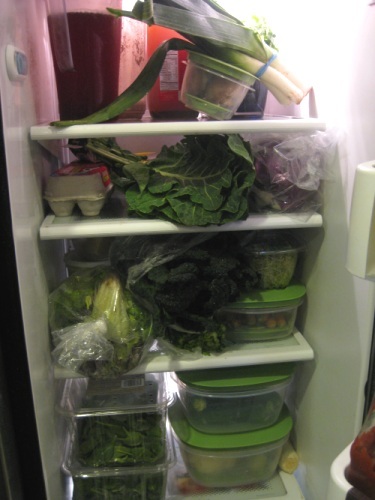 Your fridge looks so full of nutritious goodness! 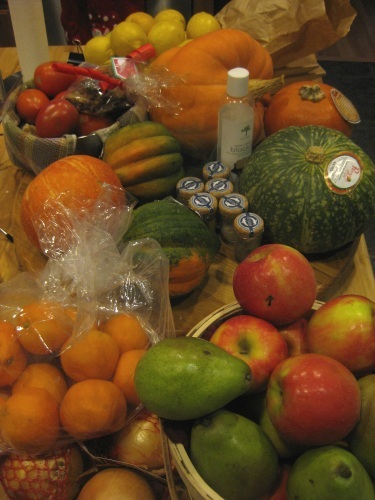 And – I love the produce spread on the island! 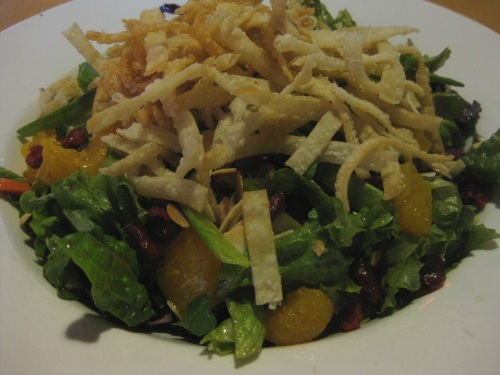 It can be so difficult to find good healthy food at restaurants that’s filling! I definitely experience that where I live. Glad you are in biz with all those veggies! OMG overload! But i know YOU of all ppl will use them. Hope you’re having an amazing day – Merry Christmas, girl!